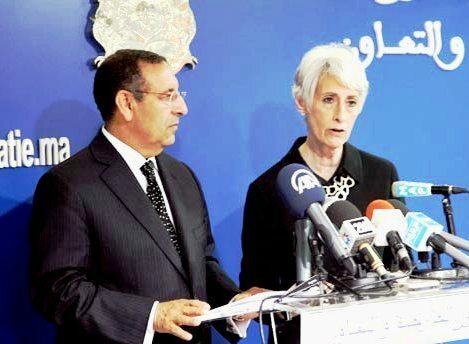 Maghreb Arab Press, Le Mag, MWN (Rabat, Morocco, June 15, 2013) – The US maintains “special” relations with Morocco, a “strategic ally” and a “leading” country in the region, said US Under-Secretary for Political Affairs, Wendy Sherman, Friday in Rabat. 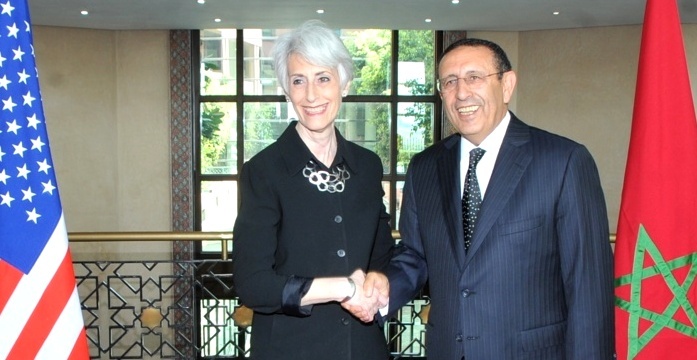 During her visit to Morocco, Ms. Sherman met with Head of Government, Abdelilah Benkirane, and spoke at a joint press briefing with Minister Delegate for Foreign Affairs and Cooperation, Youssef Amrani. Ms. Sherman stressed that strengthening the ties between the two countries reflects the common vision of His Majesty King Mohammed VI and President Barack Obama who have agreed, during their recent telephone conversation, to deepen political dialogue and strengthen bilateral relations, as part of the Strategic Dialogue. “Morocco, which acts as a leader, works for the interest of the region and the world,” said Ms. Sherman, at the press briefing. The U.S. official said that Morocco, a country which shares with the US the values of democracy and human rights, has been able to create a climate of security and prosperity, benefitting both Moroccans and Americans. 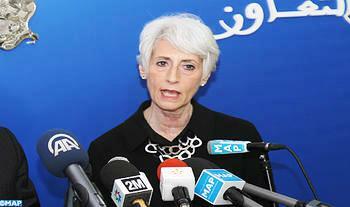 Regarding the US-Moroccan Strategic Dialogue, Ms. Sherman said Washington is determined to continue dialogue on bilateral relations and security issues in an ever-changing region. She said she discussed with Minister Amrani, among others, democratic and political reforms, the peace process in the Middle East, and the situation in Syria. Ms. Sherman said her meeting with Mr. Benkirane focused on economic issues, and political and democratic reforms launched in Morocco, as well as ways to promote bilateral relations. In these talks, which took place in the presence of Minister of State, Abdellah Baha, the two officials welcomed the long-standing friendship between the two countries, and reiterated their commitment to further strengthening bilateral cooperation, the Head of Government’s office said. Mr. Benkirane gave an overview of the political and economic reforms undertaken by the government, under the leadership of HM King Mohammed VI, which have made of the Kingdom a unique model in the region, the same source added. “This is a credible option that we welcome,” said the U.S. official during a round table with a group of Moroccan journalists, noting that the initiative reflects the intense efforts made by Morocco to find a solution to this conflict. The US official also praised the results of the Millennium Challenge Account (worth $697.5 million), signed between Morocco and the United States in 2007, noting that the success of program is such that the two countries are discussing a possible second agreement. Ms. Sherman’s visit to Morocco is part of her North Africa tour that included Libya, Egypt and Tunisia, and which will take her later to Algeria.